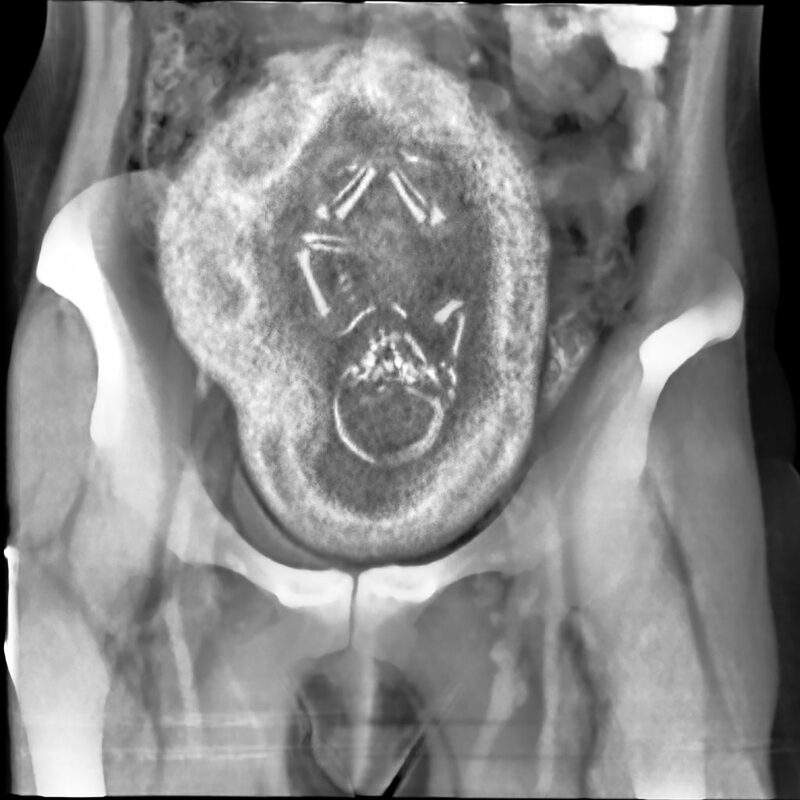 Fusion imaging is a method full of surprise. 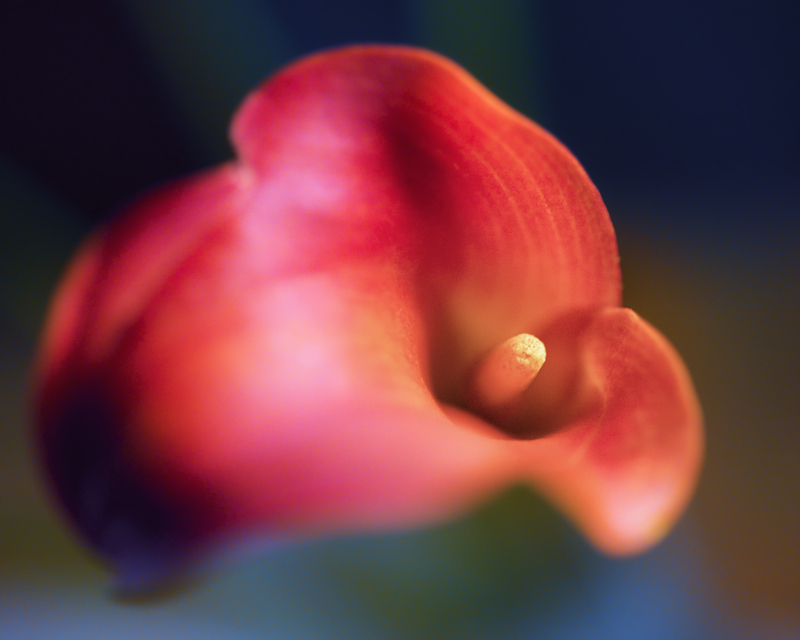 My red calla lilies revealed an effect I had forgotten completely. There must be a gradient in every X-ray exposure. Preparing a fusion image composition with my 6 red calla lilies I found a troublesome gradient in the X-ray. The cause for the gradient is a weakening of X-ray radiation at its origin in the X-ray tube. A closer look at the phenomenon can be found in my FAQ. This effect of variable recording of photons phycisists call „anode heel effect“. As part of my creative process I rotated the composition shown above by 180 degrees and exposed it a second time with the same parameters. Note that post-production as well was done equally for both X-ray exposures ! Sometimes reality falls behind our expectations. 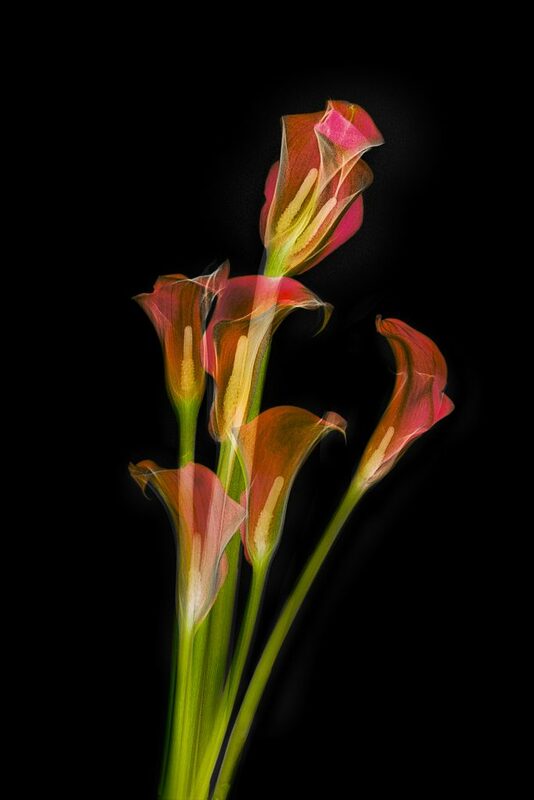 With 6 red calla lilies I felt well prepared to do some new X-rays and HDR images for image fusion. But my X-ray system surprisingly raised a barrier. The main computer stopped doing his job. Many thoughts ran through my brain. Will we be able to examine patients the next day ? How fast the supplier will be able to react ? Will the company find a cause of this disturbance ? How many days will my calla lilies be alive ? I found a work-around by thinking over the interacting hardware. Doing some steps and with a newly restarted system I was able to create 7 different compositions without further disruption of which I show here No. 4. 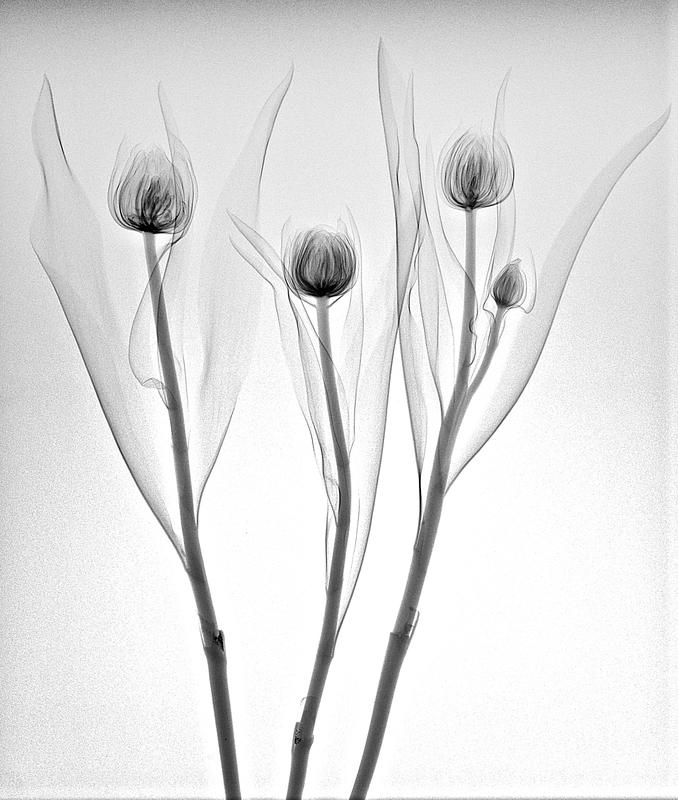 With X-rays emerges a more impressive illusion of transparency than a plain HDR would have been able to produce. Even when using a lightbox. Similar to a lightbox it produces better results when laying a petal or a complete blossom over the top of the stalk of another one. On top of the longest stalk is a twin blossom ! You never know if the inversion in Lab colors leads to an attractive result. It’s always worth looking at Lab color transformations. 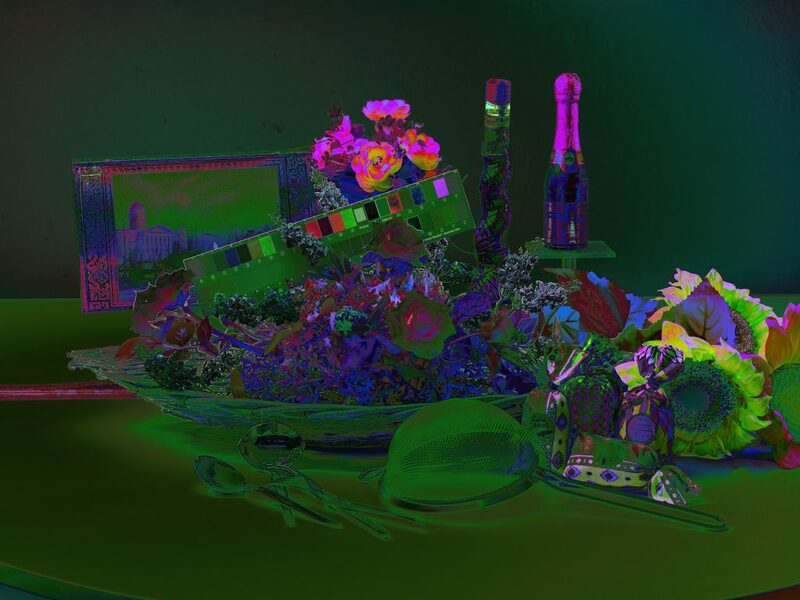 In this case the black background yields vivid colors. With my new glasses in my pocket I gazed the nearby market place on Saturday. 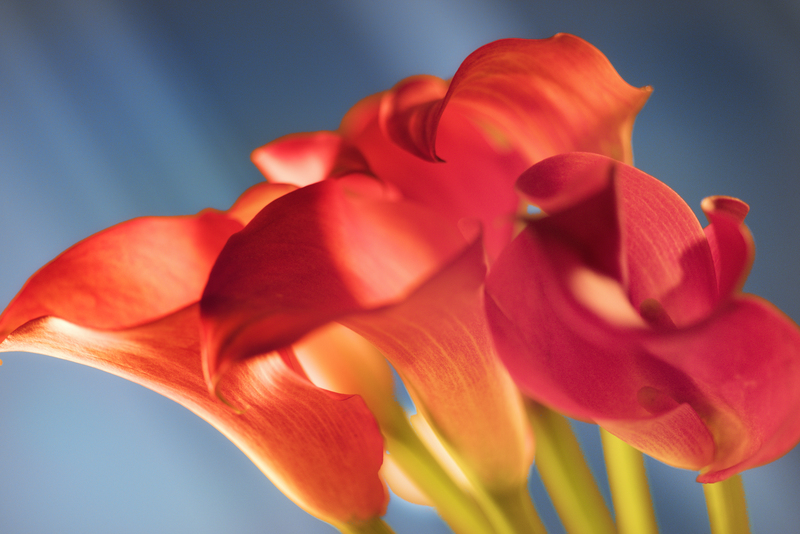 I was captivated by six red callas whose price I could knock down to 10€ for all of them. With my Zeiss 50mm Macro lens and no tripod I was trying to get nice shapes late in the evening. 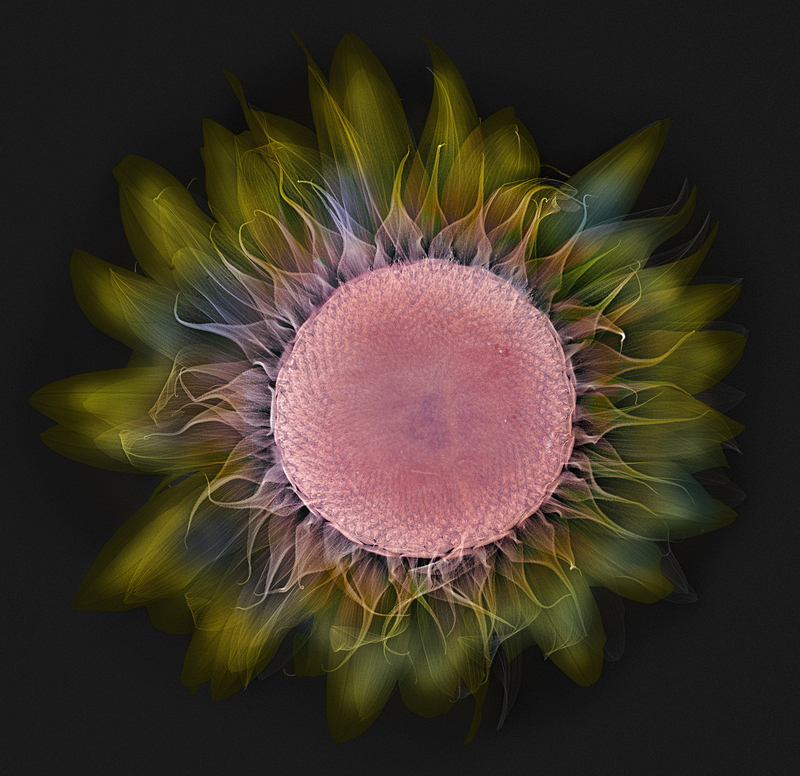 The following images have been processed using Lab color to enhance contrast and colors. Just normal light of our living room let me to a nice coloring and interesting shapes. The blossom next to the lower right corner is a Siamese twin on a double stalk. A couple of days ago I went to see a friend who knows my weakness for X-ray examinations. He gave me a mammoth tusk. At first glance I doubted if there would be any possibility to produce an image because of the estimated high density of this stone age tooth. So I decided to try a CT scan. I had some butterflies in my tummy and feared an artistic disaster. 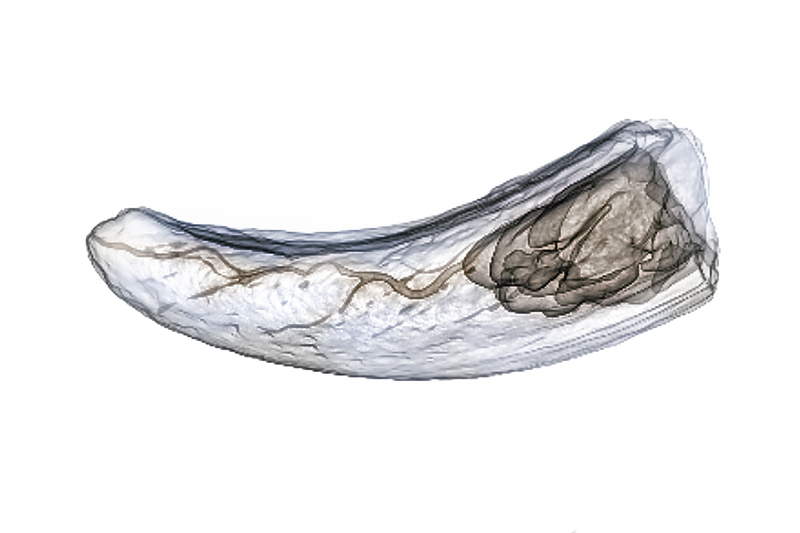 Indeed, the first slices emerging from our scanner weren’t much convincing. As a first step of postproduction My technician and I decided to do a volume rendering of the 0.75mm slices. We got a surprisingly good result that showed interesting details of the inner structure of this biological remnant. A tusk is a tooth of the upper jaw of the mammoth (or elephant). A major blood vessel branching off while running to the tip can easily be seen. The caves on right hand side are assumed to stabilize this life long weapon of a mammoth. This tusk has been stone age ivory and consists mostly of calcium phosphate and calcium carbonate. As there is no restriction to trading of mammoth ivory there is an increasing amount of siberian stone age ivory emerging to the market. I assume that everyone has had at some point the experience where less was more. Especially when dealing with computer based image postproduction. Software makes handy wonderful, or better: powerful, filters. Experienced artists know that only a pinch of something or homeopathy is a key to better results. The same holds true in X-ray production. A maximum of energy does not provide better images. Let’s look closer at this point. 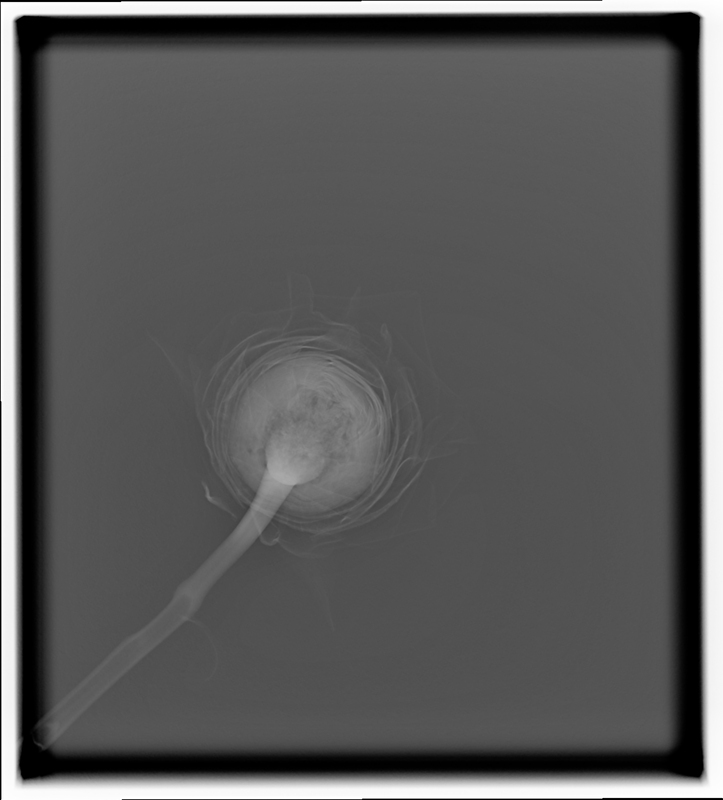 What is the influence of energy to X-ray images ? Higher energies in X-rays mean shorter wavelengths and a higher resolution. Therefore it might seem reasonable to increase the energy in our X-ray tubes always to the maximum to produce incredible images based on a maximum resolution. 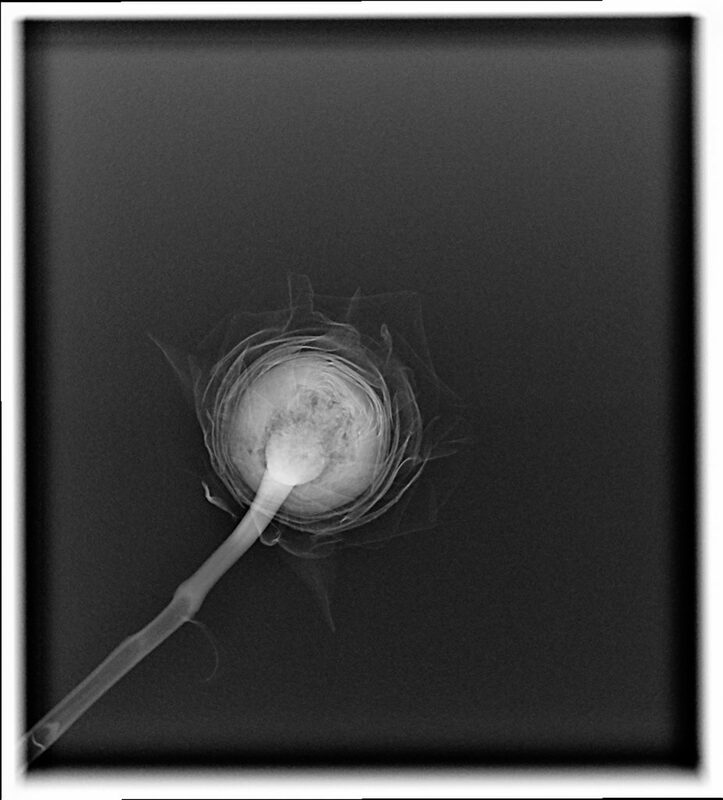 With four images below I show the influence of increased energy levels on X-ray images of a single rose. The applied energy levels are 40kV, 60kV, 90kV and 109kV. The steps of postproduction were the same in every image. Slight differences are owed to best contrast in each exposure. Surprisingly to the novice we get an increasing loss of contrast (or less available contrast) in each image with higher energies. This effect of loosing contrast can easily be seen in this series of four X-rays and is highest at 109kV. The explanation for less available contrast with higher energies is the following physical effect: the more photons have shorter wavelengths the more photons run unaffected through the object down onto the sensor. 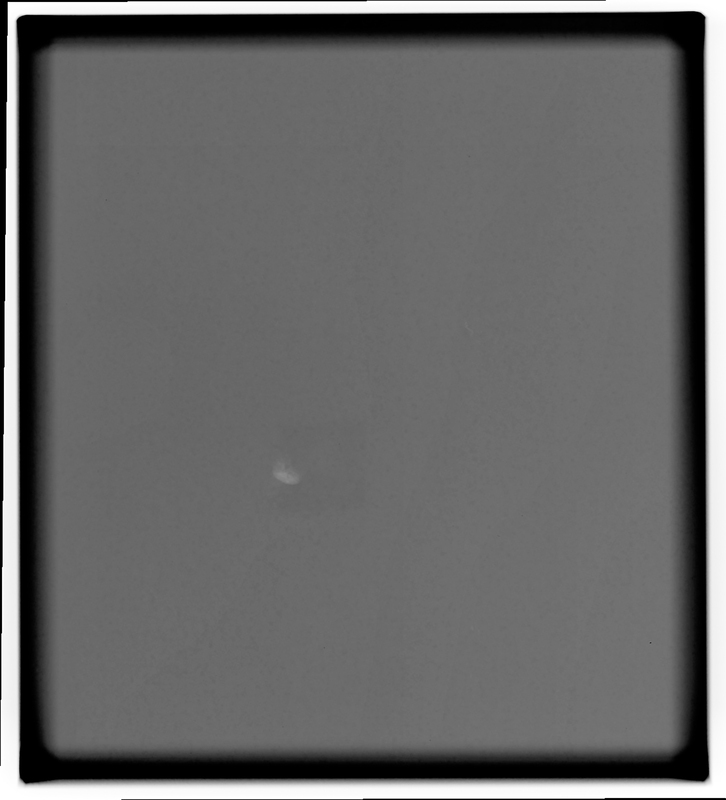 With all photons running through without any hindrance the sensor would show a homogenous gray value. 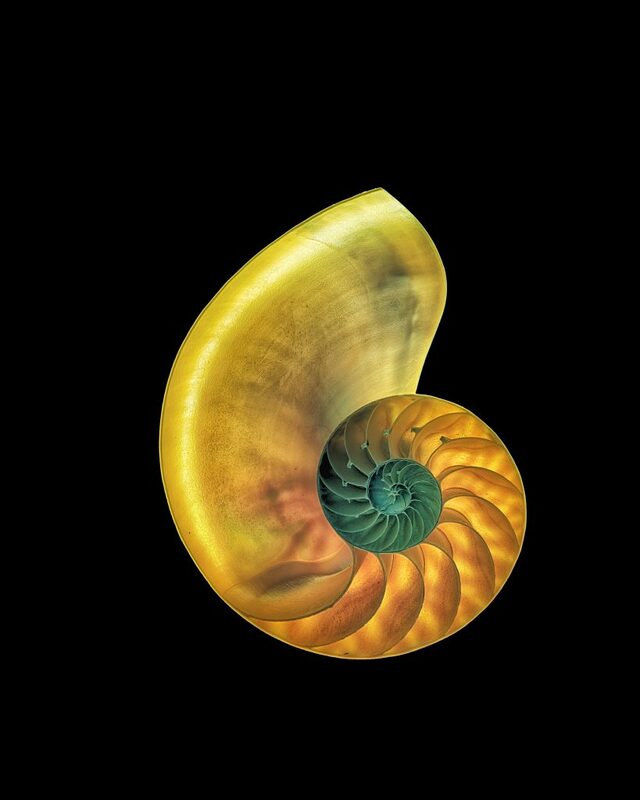 Every structure looses contrast when turning to higher energies. The optimum for a structure is found by experience and varies significantly. In the medical field the applied energy strongly depends on the purpose of the examination and the structural demands to be diagnosed. The above demonstrated meaningless low contrast for our single rose at 109kV doesn’t hold true at all in radiology. Radiologists use frequently 125kV for a chest film to get reproducibly valuable contrast in most patients. 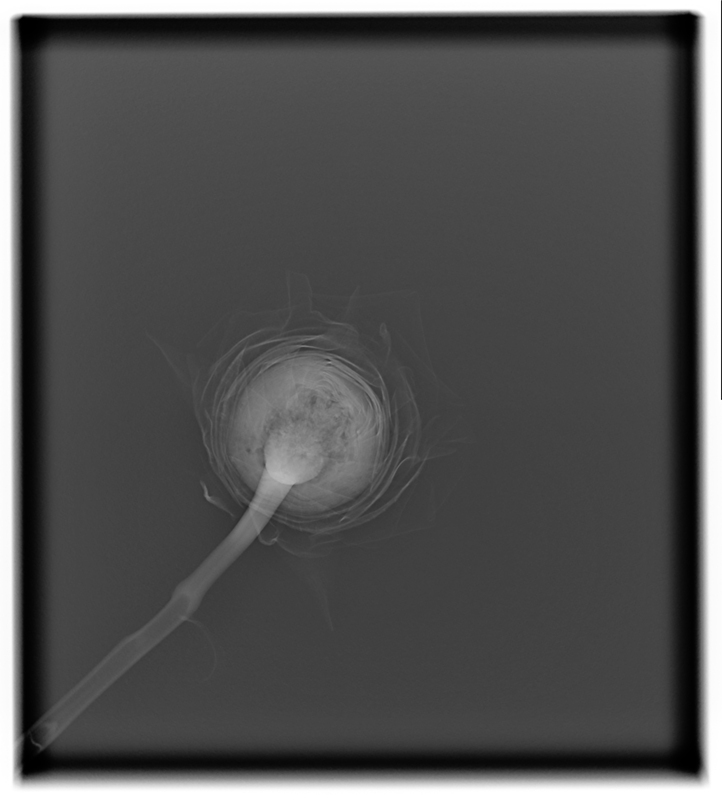 Fusion imaging is beauty made of composite X-ray images and HDR images on a light box. 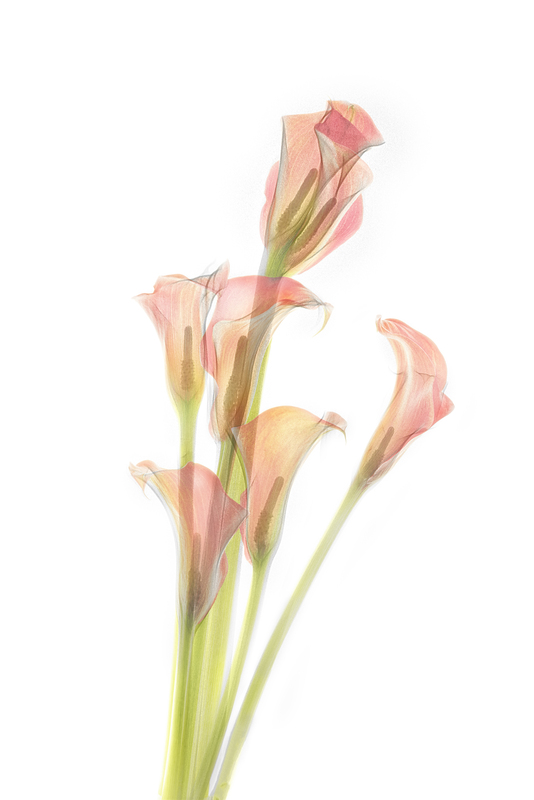 The primary question is what energy fits best for flowers. To my experience 40 kV is often suitable. But: the proof of the pudding is in the eating. Mammography systems start e.g. from 20 kV and reach 39 kV. The sensor is up to 24cm x 30cm. Conventional systems start from 40 kV and reach 125 kV. 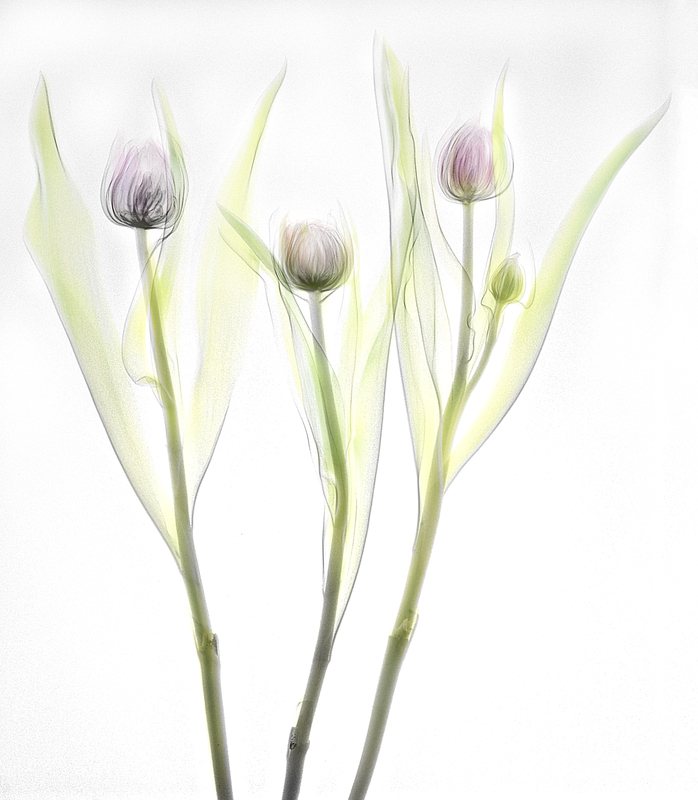 The sensor is up to 43cm x 43cm what makes them more attractive to floral compositions. The higher resolution and the lower energies of a mammography will suit better for transparent objects. But the spatial limit of a composition (which is 24cm x 30cm) might put hard restrictions on the artist. 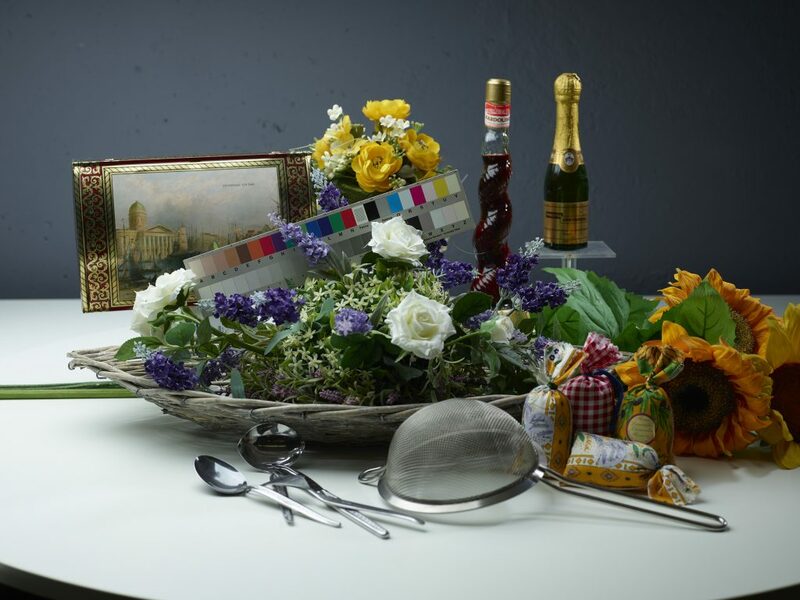 Floral compositions have more creative space with a bigger sensor. But the X-ray tube starts with 40 kV and this might lead to overexposure of tender structures. Thus I performed today more than ten compositions to study this relation. 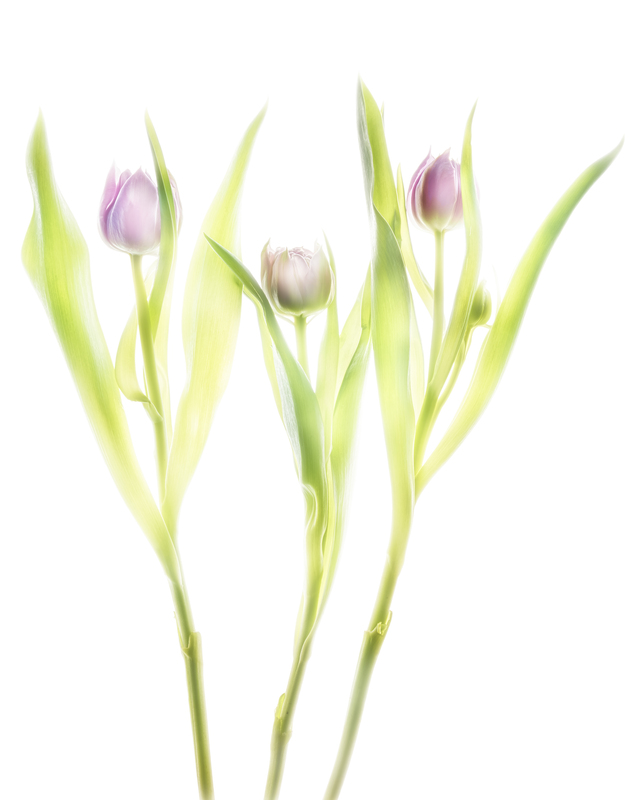 After four exposure of three tulips I found this composition with four dense blossoms attractive to go further. The composition might somehow resemble to a sketch of three angels. The image is nice due to very soft edges of their „wings“, technically blown out portions in the image. The inner structure of the nearly closed blossoms is well resolved. The stalks serve as „body“. There is no advantage with higher energies. 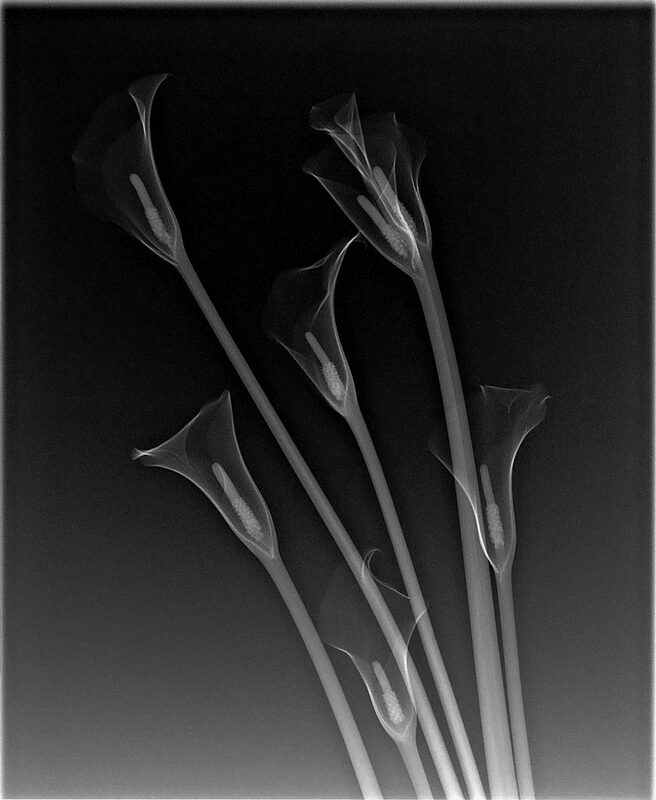 The same composition was done immediately after the X-ray as a bracketing series on a lightbox. After returning I processed a manual HDR, the colors not to warm. The final fusion image is a composite of the preceding two images. Compared to the lightbox photo, the hidden stalks reappear naturally, the inner petals are outlined like a sketch. 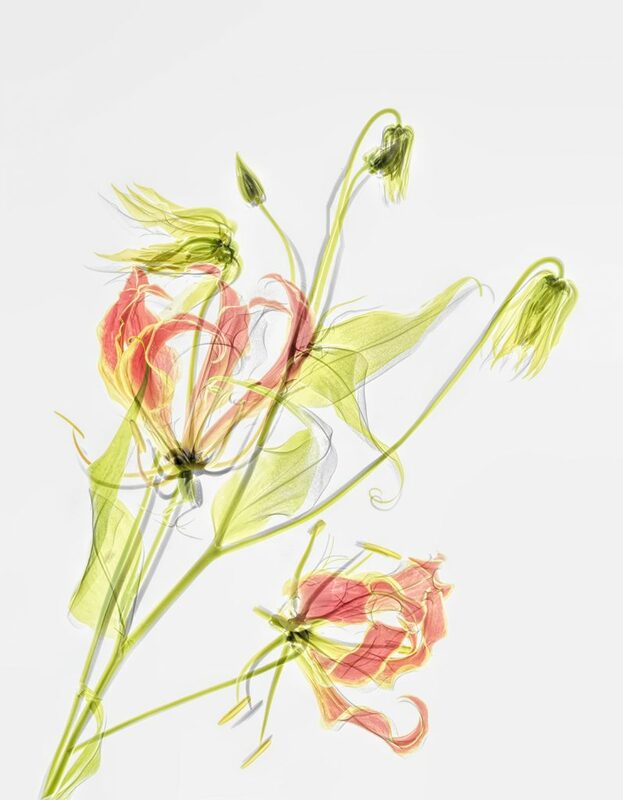 This nice article was posted today to share the fascination of our common work on fusion X-ray images using a light box manual HDR photo of flowers and their X-ray. Our X-ray data are the same, our photographic data a nearly the same: Harold used a Nikon D850 and I used a Nikon D810A, which is modified for astrophotography. Our common lens was a Zeiss Makro-Planar T* 2/50 ZF.2. We have some techniques and some principles in common, yet we are different individuals with different results. The next image is partly inspired by Harold’s version. Blue is the complementary color to yellow and fits nicely into the petals. The red color in the center is an image of the sun in monochromatic Hα light using a Fabry-Perot-Interferometer. So this image is a triple fusion image of three different light sources ! If you look closer at 2pm in the center, there are two sunspots. Fusion imaging can be done retrospective. 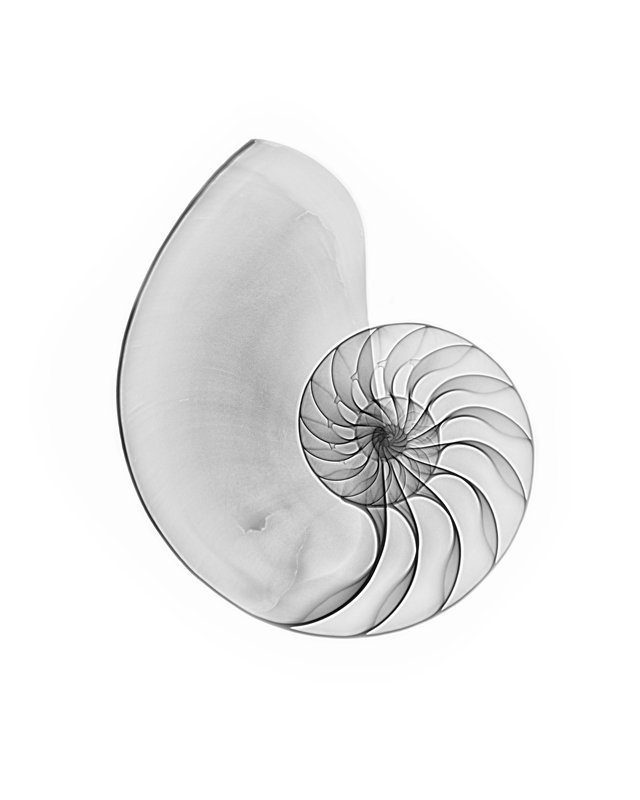 My split Nautilus shell on a light box rendered with manual HDR shows already a nice structure of the inner parts. The X-ray obtained a couple of days earlier easily fits onto the HDR with not a big deal of processing. The meaning of the fusion image may be different to the flowers. But it’s feasible to do it retrospectively. There are many stops put to a CT-scan, especially when dealing with women in reproductive age. We are always very careful before exposing any patient to radiation. This middle-aged patient with repeatedly nausea and discomfort opposing pregnancy very strict and claiming menstruation 28 days ago underwent some medical examinations including gastroscopy and, eventually, a CT-scan. We were prepared for a tumor when scanning the abdomen. 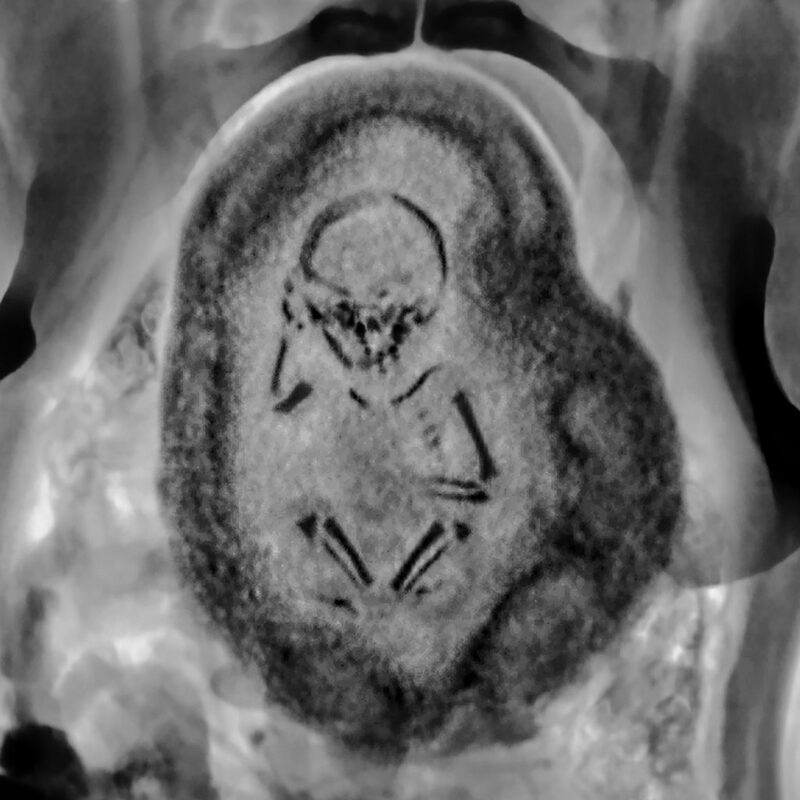 We were amazed to find a baby despite many questions about patient’s history before the exam. Maybe, some obesity covered the situation with a veil. You can see the bones of the upper and lower extremities, as well as the skull and some parts of the spine. The ossification of knees, feet and hands will take place the next ten years after birth. It appears to be discussion-worthy if it’s a boy. Our methods didn’t lead us further on this. To me the rotated, inverted and cropped image resembles to cave paintings. These paintings are assumed to be some kind of religious art, reflecting astonishment and grandeur of lost civilizations. Certain is, the baby touches its right ear, as it was amazed by itself or reflecting its life. What else than human life is this ?